Tell us about yourself. How did you come to arm-wrestling and why did you choose this sport? – In armsport I came in 2003, at the age of 14. In the courtyard, we often had armwrestling competitions and I pulled with boys who, in the end, I won. Then in the sports complex, which was not far from us, an arm-sport section was opened, and I decided to try my hand at it. This year, you took a gold double. How long did you go for this? – I won several times championships of Russia, in 2006 I won the European Championship among juniors, and in 2007 – the World Championship in senior class. Due to lack of funding, I missed many competitions. In 2010 I got married and now I have two children. After a five-year break, I returned to the sport team, only I am already in favor of the Georgian team, to which I am grateful for the fact that they accepted me and strongly support me. In 2015, I lost at the World Championship, after which I began to train hard, and a year later the medals of Europeans and Worlds were mine. I had to change the category - moved to 65 kg, because I threw off 10 kg for 60 kg. I am trained by Bondo Khubulov, to whom I am very grateful for my achievements in this sport. He persuaded me for a long time, saying that in 65 kg it would be harder for me, and my training sessions did not go the way we wanted, and old injuries were felt. In general, we were preparing just how could. Who was your most serious rival? – Going to another weight category, I did not think that there could be someone weaker than me. But more serious for me at this European Championship was Marlena Wawrzyniak and Sara Nyberg, because they always took the prizes at this weight. Whose fight in the championship did you like the most? 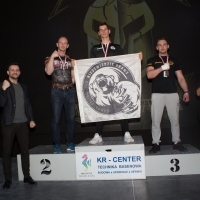 – This European Championship was full of spectacular fights, but the most vivid and memorable was the fight between Khetag Dzitiev and Davit Samushia. What is the basis of your training? What do you spend more time on – iron or sparring? – I spend a lot of time on the gland, but after every training we also work on the technique. Tell us about your plans for the future. – I do not plan further, but this year I will try to repeat my golden double at the World Championships in Budapest. Kydyrgali Ongarbaev: "I will miss this World Championship"
Is it worth to start when you are 40 years old? Slow muscle fibers = endurance?